Freedom Yurt Cabins: The first designers of solid walled yurts that are competitively priced with fabric yurts. They are all constructed with solid wood and insulation. Contact at [email protected] or (719) 362-3333 or visit their website for more information. Outback Yurts: Custom backcountry yurts with hand-peeled lodgepole pine rafters, designed for heavy snow loads. Located in Stanley, Idaho since 1978 Call (208) 774-3324 for information. CampingYurts.com: An Oregon based yurt company that focuses on highly portable yurts. Great Britain, Holland, Denmark and Italy. 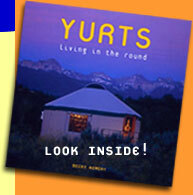 The Yurt Foundation: Established by Bill Coperthwaite in 1971, works with groups to build yurts as a part of a community or educational experience. Also sells plans. Write to: The Yurt Foundation, Dickinsons Reach, Machiasport, Maine 04655. Solargon: Energy-saving hexagonal structure designed to take full advantage of the sun. Located in Loveland, CO.